Buddhism in Cambodia is currently a form of Theravada Buddhism. Buddhism has existed in Cambodia since at least the 5th century, and in its earlier form was a type of Mahāyāna Buddhism. Theravada Buddhism has been the Cambodian state religion since the 13th century (except during the Khmer Rouge period), and is currently estimated to be the faith of 95% of the population. The history of Buddhism in Cambodia spans across a number of successive kingdoms and empires. Buddhism entered Cambodia through two different streams. The earliest forms of Buddhism, along with Hindu influences, entered the Funan kingdom with Hindu merchants. 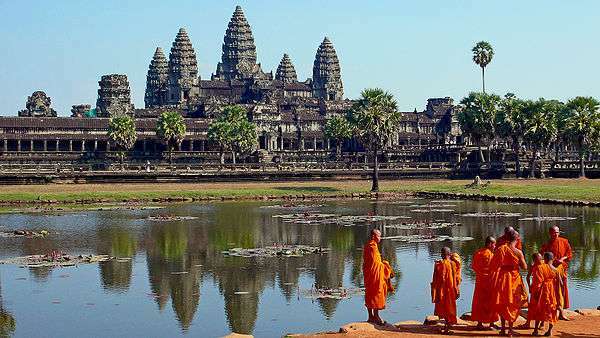 In later history, a second stream of Buddhism entered Khmer culture during the Angkor empire when Cambodia absorbed the various Buddhist traditions of the Mon kingdoms of Dvaravati and Haripunchai. The Funan Kingdom that flourished between 100 BC and 500 AD was Hindu, with the kings of Funan sponsoring the worship of Vishnu and Shiva. Buddhism was already present in Funan as a secondary religion in this era. Buddhism began to assert its presence from about year 450 onward, and was observed by the Chinese traveler Yijing toward the close of the seventh century. The Kingdom of Chenla replaced Funan and endured from 500-700. Buddhism was weakened in the Chenla period, but survived, as seen in the inscriptions of Sambor Prei Kuk (626) and those of Siem Reap dealing with the erection of statues of Avalokiteśvara (791). Some pre-Angkorean statuary in the Mekong Delta region indicate the existence of Sanskrit-based Sarvāstivāda Buddhism. Khmer-style Buddha images are abundant from the period of 600-800. Many Mahāyāna bodhisattva images also date from this period, often found alongside the predominantly Hindu images of Shiva and Vishnu. An inscription from Ta Prohm temple in Siem Reap province, dated about 625, states, that the Buddha, Dharma and Sangha are flourishing. The Buddhist Sailendra kingdom exercised suzerainty over Cambodia as a vassal state during the end of the eighth and the beginning of the ninth centuries. King Jayavarman II (802-869), the first real Khmer king of the Angkor Empire, proclaimed himself god-king and identified himself with Shiva. Nevertheless, he was increasingly friendly to and supportive of Mahayana Buddhist influence throughout his kingdom. 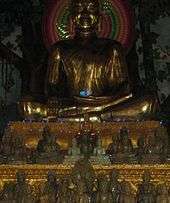 Mahayana Buddhism became increasingly established in his empire. 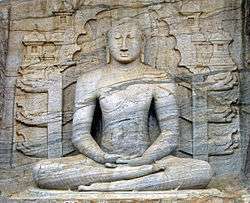 The form of Mahayana Buddhism that was propagated in the Srivijaya lands was similar to the Pala Dynasty Buddhism of Bengal, and of the Nalanda University in northern India. The Bengal University of Nalanda in Megadha (now Behar) was the theological center of Mahayana Buddhism under the protection of the Pala Dynasty [750-1060]. Shivaist interpretations of Buddhism, tinged with Tantric mysticism (that may have revived portions of pre-Aryan northeastern Indian faith traditions) were worked out in Megadha and then were exported throughout insular and peninsular Southeast Asia, particularly to Java. Yashovarman I (889-910), who ruled from the vicinity of Rolous in the late ninth century, seems to have been a Shivite Buddhist influenced by Nalanda syncretism. 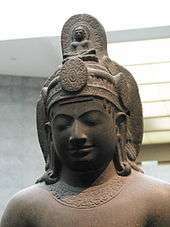 His successors (notably Jayavarman IV) dedicated themselves to Vishnu and Brahma, as well as to Shiva, with whom they continued to be identified by hereditary families of priests. Rajendravarman II studied Buddhism intensely. The prevalence of Tantrayana in Java, Sumatra and Kamboja [Cambodia], a fact now definitely established by modern researches into the character of Mahayana Buddhism and Sivaism in these parts of the Indian Orient. Already in Kamboja inscription of the 9th century there is definite evidence of the teaching of Tantric texts at the court of Jayavarman II. In a Kamboja record of the 11th century there is a reference to the 'Tantras of the Paramis'; and images of Hevajra, definitely a tantric divinity, have been recovered from amidst the ruins of Angkor Thom. A number of Kamboja inscriptions refer to several kings who were initiated into the Great Secret (Vrah Guhya) by their Brahmanical gurus; the Saiva records make obvious records to Tantric doctrines that had crept into Sivaism. The Khmer Rouge policies towards Buddhism- which included the forcible disrobing of monks, the destruction of monasteries, and, ultimately, the execution of uncooperative monks effectively destroyed Cambodia's Buddhist institutions. Monks who did not flee and avoided execution lived among the laity, sometimes secretly performing Buddhist rituals for the sick or afflicted. Estimates vary regarding the number of monks in Cambodia prior to the ascension of the Khmer Rouge, ranging between 65,000 and 80,000. By the time of the Buddhist restoration in the early 1980s, the number of Cambodian monks worldwide was estimated to be less than 3,000. The patriarchs of both Cambodian nikayas perished sometime during the period 1975-78, though the cause of their deaths is not known. Due to their association with the Thai monarchy, monks of the Thommayut order may have been particularly targeted for persecution. Following the defeat of the Khmer Rouge by forces of the Vietnamese government, Buddhism initially remained officially suppressed within Cambodia. Following challenges to the legitimacy of the Vietnamese-backed People's Republic of Kampuchea, policies towards Buddhism began to liberalize starting in the summer of 1979. A group of monks who had been exiled and re-ordained in Vietnam during the Khmer Rouge period were sent to Cambodia, and in 1981 one of their number, Venerable Tep Vong, was elected the first sangharaja of a new unified Cambodia sangha, officially abolishing the division between the Thommayut order and the Mohanikay. The ordination of new monks was sponsored by the government as a public show of piety and lifted restrictions on ordination. Following the withdrawal of the Vietnamese military, the newly renamed Cambodian People's Party sought to align itself with the Buddhist sangha, declaring Buddhism to be Cambodia's 'state religion' in a 1991 policy statement In 1991, King Sihanouk returned from exile and appointed a new sangharaja for each of the Thommayut and Mohanikay orders, effectively marking the end of the unified system created under Vietnamese rule in 1981. The Maha Nikaya monastic hierarchy- headed by the sanghreach (sangharaja)- has been closely connected with the Cambodian government since its re-establishment in the early 1980s  High-ranking officials of the Maha Nikaya have often spoken out against criticism of the government and in favor of government policies, including calling for the arrest of monks espousing opposition positions. Officials from the Maha Nikaya hierarchy appoint members to lay committees to oversee the running of temples, who also act to ensure that temples do not become organizing points for anti-government activity by monks or lay supporters Nevertheless, divisions within the Maha Nikaya fraternity do exist. Divisions within the sangha between "modernists" and "traditionalists" were recorded in Cambodia as early as 1918. Broadly speaking, "modernists" have attempted to respond to Western criticism of Buddhist institutions by re-interpreting Buddhist teachings- particularly those related to philosophy and meditation- in light of both modern secular knowledge and the textual source of Theravada teachings- the Pali Canon. "Traditionalist", on the other hand, prefer to stick to the practices and teachings handed down through the monastic oral tradition, which have traditionally centered on the performance of merit-making ceremonies and the attainment of "heightened states" through concentration meditation. Traditionalists have tended to reject modern interest in vipassana meditation as a foreign affectation, and have focused on the rote memorization and recitation of Pali passages rather than attempts to study, translate, and interpret the contents of the Pali tripitaka. For many years, Maha Ghosananda remained the most visible and recognizable figure of the Maha Nikaya modernists. Through his Dhammayatra program and other attempts to use the influence of the sangha to effect social change in Cambodian society, Maha Goshananda brought to Cambodia a form of Engaged Buddhism not previously seen among Cambodian religious institutions. This form of modernist, Engaged Buddhism has proved very popular with Western Buddhists and NGO's, who have lent their support and funding to efforts by Maha Goshananda and other modernist leaders. High officials of the Cambodian government, by contrast, have tended to support the most conservative of the Maha Nikaya monks, particular the members of a segment known as the boran, an ultra-conservative movement that touts the worldly efficacy of the rote recitation of various Pali and Khmer prayers and discourses. Monks in the boran movement do not typically possess a significant knowledge of Pali, instead focusing on the rote memorization and recitation of certain verses and scriptures considered powerful. Boran monks maintain that by sponsoring recitations of these verses, lay supporters can accrue great merit that will result in immediate, worldly benefits, such as financial or career success. A large number of senior Cambodian officials (including Hun Sen) have patronized boran temples, providing for extensive expansions and rich decoration of the most popular temples. Boran monks also teach the efficacy of 'group repentance' rituals, where through the recitation of Pali texts the karmic fruit of earlier misdeeds can be avoided or moderated. These rituals, which developed from New Years repentance ceremonies, have become very popular among certain segments of Cambodian society, and have been conducted by the current Maha Nikaya sangharaja, Tep Vong. The Dhammayuttika order in Cambodia seems to occupy a middle position between the Maha Nikaya modernists and traditionalists. Like the Dhammayuttika order in Thailand, they place a higher premium on scriptural study and knowledge of the Pali language than the monks of the traditionalist camp. At the same time, they have not embraced the modernist/Engaged notion of monks as agents of social development, preferring instead to stick closely to traditional monastic roles of study, meditation, and providing merit-making opportunities for lay supporters. In their attempt to separate the Khmer people from their cultural allegiance to the neighboring Theravada kingdom of Siam, the French "protectors" nurtured a sense of Khmer identity by emphasizing Khmer-language studies and Khmer Buddhist studies. They established Pali schools within Cambodia to keep the Cambodian monks from traveling to Siam for higher education. These Khmer-language study centers became the birthplace of Cambodian nationalism. Cambodian Buddhism has no formal administrative ties with other Buddhist bodies, although Theravada monks from other countries, especially Thailand, Laos, Burma, and Sri Lanka, may participate in religious ceremonies in order to make up the requisite number of clergy. Cambodian Buddhism is organized nationally in accordance with regulations formulated in 1943 and modified in 1948. During the monarchical period, the king led the Buddhist clergy. Prince Sihanouk continued in this role even after he had abdicated and was governing as head of state. He appointed both the heads of the monastic orders and other high-ranking clergy. After the overthrow of Sihanouk in 1970, the new head of state, Lon Nol, appointed these leaders. Each order has its own superior and is organized into a hierarchy of eleven levels. The seven lower levels are known collectively as the thananukram; the four higher levels together are called the rajagana. The Mohanikay order has thirty-five monks in the rajagana; the Thommayut has twentyone . Each monk must serve for at least twenty years to be named to these highest levels. The cornerstones of Cambodian Buddhism are the Buddhist bhikkhu and the wat. Traditionally, each village has a spiritual center—a wat—where from five to more than seventy bhikkhus reside. A typical wat in rural Cambodia consists of a walled enclosure containing a sanctuary, several residences for bhikkhus, a hall, a kitchen, quarters for nuns, and a pond. The number of monks varies according to the size of the local population. The sanctuary, which contains an altar with statues of the Buddha and, in rare cases, a religious relic, is reserved for major ceremonies and usually only for the use of bhikkhus. Other ceremonies, classes for monks and for laity, and meals take place in the hall. Stupas containing the ashes of extended family members are constructed near the sanctuary. Fruit trees and vegetable gardens tended by local children are also part of the local wat. The main entrance, usually only for ceremonial use, faces east; other entrances are located at other points around the wall. There are no gates. Steinberg notes the striking ratio of bhikkhus to the total population of Cambodia. In the late 1950s, an estimated 100,000 bhikkhus (including about 40,000 novices) served a population of about 5 million. This high proportion undoubtedly was caused in large part by the ease with which one could enter and leave the sangha. Becoming a bhikkhu and leaving the sangha are matters of individual choice although, in theory, nearly all Cambodian males over sixteen serve terms as bhikkhus. Most young men do not intend to become fully ordained bhikkhus (bhikkhu), and they remain as monks for less than a year. Even a son's temporary ordination as a bhikkhu brings great merit to his parents, however, and is considered so important that arrangements are made at a parent's funeral if the son has not undergone the process while the parent was living. There are two classes of bhikkhus at a wat—the novices (samani or nen) and the bhikkhu. Ordination is held from mid-April to mid-July, during the rainy season. Buddhist monks do not take perpetual vows to remain monks although some become monks permanently. Traditionally, they became monks early in life. It is possible to become a novice at as young an age as seven, but in practice thirteen is the earliest age for novices. A bhikkhu must be at least twenty. The monk's life is regulated by Buddhist law, and life in the wat adheres to a rigid routine. A bhikkhu follows 227 rules of monastic discipline as well as the 10 basic precepts. These include the five precepts that all Buddhists should follow. The five precepts for monastic asceticism prohibit eating after noon, participating in any entertainment (singing, dancing, and watching movies or television), using any personal adornments, sleeping on a luxurious bed, and handling money. In addition, a monk also is expected to be celibate. Furthermore, monks supposedly avoid all involvement in political affairs. They are not eligible to vote or to hold any political office, and they may not witness a legal document or give testimony in court. Since the person of a monk is considered sacred, he is considered to be outside the normal civil laws and public duties that affect lay people. Some of these practices have changed in the modern period, however, and in the 1980s Buddhist monks have been active even in the PRK government. Buddhist monks traditionally were called upon to perform a number of functions in Cambodian life. They participated in all formal village festivals, ceremonies, marriages, and funerals. They also might have participated in ceremonies to name infants and in other minor ceremonies or rites of passage. Monks did not lead the ceremonies, however, because that role was given to the achar, or master of ceremonies; the monk's major function was to say prayers of blessing. They were often healers and, in traditional Khmer culture, they were the practitioners whose role was closest to that of modern psychiatrists. They might also have been skilled in astrology. 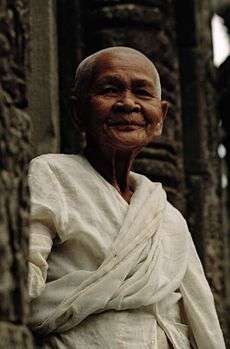 The monk traditionally occupied a unique position in the transmission of Khmer culture and values. By his way of life, he provided a living model of the most meritorious behavior a Buddhist could follow. He also provided the laity with many opportunities for gaining merit. For centuries monks were the only literate people residing in rural communities; they acted as teachers to temple servants, to novices, and to newly ordained monks. Until the 1970s, most literate Cambodian males gained literacy solely through the instruction of the sangha. After independence from France, young Cambodian intellectuals changed their attitude toward the clergy. In describing a general shift away from Buddhism in the late 1950s and the early 1960s, Vickery cites the early work of anthropologist May Mayko Ebihara and his own observations. He suggests that the Khmer Rouge was able to instill antireligious feelings in younger males because the latter were losing interest in becoming monks even during their teenage years, the traditional temporary period of service. The monks themselves had abandoned some of their traditional restrictions and had become involved in politics. At intervals during the colonial period, some monks had demonstrated or had rebelled against French rule, and in the 1970s monks joined pro- government demonstrations against the communists. Anticlerical feelings reached their highest point among the Khmer Rouge, who at first attempted to indoctrinate monks and to force them to pass anticlerical ideas on to the laity. Under the Khmer Rouge regime, monks were expelled forcibly from the wats and were compelled to do manual labor. Article 20 of the 1976 Constitution of Democratic Kampuchea permitted freedom of religion but banned all reactionary religions, that were "detrimental to the country." The minister of culture stated that Buddhism was incompatible with the revolution and was an instrument of exploitation. Under this regime, to quote the Finnish Inquiry Commission, "The practice of religion was forbidden and the pagodas were systematically destroyed." Observers estimated that 50,000 monks died during the Khmer Rouge regime. The status of Buddhism and of religion in general after the Vietnamese invasion was at least partially similar to its status in pre-Khmer Rouge times. Martin offers another, more pessimistic, view of the religious situation in the late 1980s. In a 1986 study, she asserts that the PRK showed outsiders only certain aspects of religious freedom; she also states that the few wats that were restored had only two or three old monks in residence and that public attendance was low. The monks were allowed to leave the wats only for an hour in the mornings, to collect their food, or during holy days. Lay people who practiced their faith were about the same ages as the monks, and they were allowed to visit the wats only in the evenings. A government circular had also instructed civil servants to stop celebrating the traditional New Year Festival. Some traditional Buddhist festivals still were tolerated, but the state collected a 50 percent tax on donations. Martin believes that Buddhism was threatened externally by state repression and by nonsupport and internally by invalid clergy. She noted that the two Buddhist superiors, Venerable Long Chhim and Venerable Tep Vong, were both believed to be from Vietnam. Venerable Tep Vong was concurrently the superior of the Buddhist clergy, vice president of the PRK's Khmer National Assembly, and vice president of the KUFNCD National Council. She quoted a refugee from Batdambang as having said, "During the meetings, the Khmer administrative authorities, accompanied by the Vietnamese experts, tell you, `Religion is like poison, it's like opium; it's better to give the money to the military, so they can fight'." ↑ "CIA World Factbook - Cambodia". Retrieved 2007-04-10. ↑ Tully, John. France on the Mekong. 1 2 3 Gyallay-Pap, Peter. "Notes of the Rebirth of Khmer Buddhism," Radical Conservativism. 1 2 3 4 5 O'Murray, Stephen. Angkor Life. ↑ Tarling, Nicholas (1992-01-01). The Cambridge History of Southeast Asia: Volume 1, From Early Times to C.1800. Cambridge University Press. ISBN 9780521355056. 1 2 Keyes, Charles. The Golden Peninsula. 1 2 3 4 5 6 7 8 9 10 11 12 13 14 15 16 17 18 19 Federal Research Division. Russell R. Ross, ed. "Role of Buddhism in Cambodian Life". Cambodia: A Country Study. Research completed December 1987. This article incorporates text from this source, which is in the public domain. Buswell, Robert E., ed. (2004). Encyclopedia of Buddhism (Cambodia). Macmillan Reference USA. pp. 105–110. ISBN 0-02-865718-7.